What is the difference between grass fed beef flank and skirt steak and how should you prepare them? Grass fed beef flank steak and skirt steak are two of the most delicious cuts of beef but people often don’t know how fantastic they are or how to prepare them. While there are distinctions because they are completely different cuts of meat, there are also some similarities between the two steaks. In fact, if you look for images of the two cuts of steak, you’ll get pictures of both returned in your search whether you search for flank or skirt steak. We’ll try to explain all about these great steaks here. Of all the less expensive cuts on the cow, skirt steak may be the best value for the flavor return. Filled with lots of buttery, beefy fat with intense, rich flavor and a tender, juicy texture. Some will choose this steak over a Rib Eye or New York strip because they feel the flavor and texture is superior. Because this is a tougher cut of beef, it is crucial to marinate, cook and slice it properly. When it is overcooked or sliced thickly or with the grain, it can be so difficult to chew as to be inedible. We’ll talk about proper cooking techniques and what the “grain” is and slicing below. Where is this cut from? The skirt steak is from the diaphragm muscle of the cow, cut from the plate. This is a well used muscle from the under side of the cow. The grain is loose and prominent and the marbling melts as it cooks providing super rich and buttery flavor. Cooking skirt steak is quick and simple. After marinating overnight, it requires only a couple minutes per side on an extremely hot grill or heavy pan. You are looking for a a nice caramelized char on the outside before it overcooks in the middle. With other grass fed steaks, the thickness requires a more moderate heat so that you don’t end up with a blackened, burnt outside before the center can attain a nice medium rare. Skirt steak is so thin the opposite problem happens – if you take it easy you won’t get that flavorful crust until the inside is over cooked. As is the case with most of the less expensive cuts of grass fed steak, how you slice the meat is as important as the way you cook it. Skirt steak should be sliced thinly across the grain. Look at your steak and see the direction that the muscle fibers run. Now imagine you want to cut those long muscle fibers into very short fibers. Think of the “grain” as lengths of string and you want to snip those strings into short bits. Skirt steak grain direction can vary by steak, however, it is often running the width of the steak and not the length. This means, the easiest way to slice across the grain will be to cut the entire steak into 3-4 inch lengths, then rotate the meat to thinly slice it. If you have a skirt steak where the grain does run the length of the piece of meat, you can just slice thinly from end to end. Skirt steak is most commonly served in fajitas but some recipes will call for a slow braising (like a Cuban ropa vieja) where the meat is pulled apart into tender strings of beef. They can be served just as deliciously over a green salad or sliced on a plate with any side you can imagine. This steak is so flavorful, it doesn’t need a sauce or lots of toppings. 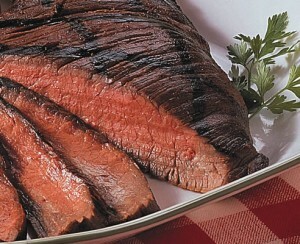 Flank steak is another less expensive, tougher cut of beef. It has a robustly beefy flavor and a pleasant texture with a good mouth feel or chew. Flank steaks are cut from the the abdominal muscles of the cow, just behind the plate muscle the skirt steak is cut from. They typically are sold whole, between 2-4 pounds each. We have our organic grass fed flanks steaks cut into smaller 8 oz. portions to allow for portion control. Additionally, this allows you to enjoy them even when you don’t have a large family or a party planned. Like the skirt steak, flank steak benefits from an overnight marinade as well. It is also just as important that you follow the instructions above for slicing across the grain, thinly and, in addition, on a bias. What does it mean to slice on the bias? Just hold your knife at an angle to the cutting board while slicing. After removing from the marinade, prepare your flank steak for the grill by patting the steak dry, rubbing with oil and sprinkling with salt and pepper or your favorite grill seasoning. Because a flank steak is thicker than a skirt steak, it has unique grilling requirements. Set your charcoal grill up where the coals are piled on one half for a very hot side and an indirect heat (lower temperature) side. If using a gas grill, leave one of the burners off. Start the steak on the high temperature side to get that great char, turn once to char the other side, about 3 minutes per side. Then, move the steak to the cooler part of your grill and close the lid. This allows the inside of the meat to come up to a perfect medium rare without burning the exterior. Once your steak is cooked to the temperature you enjoy, remove from the grill to let rest about, covered with foil, for about 5 minutes. This is important so that when you slice your meat, it doesn’t lose all those tasty juices on your cutting board. While the traditional filling for fajitas is skirt steak, flank steak is also excellent in this preparation. You will also find recipes which require a slow braise, like an Italian Braciole where the steak is filled with a savory mixture and rolled before cooking. This entry was written by Jeff, posted on August 15, 2013 at 6:48 pm, filed under Grass Fed Beef and tagged beef, flank, grass fed, meat, skirt, steak. Bookmark the permalink. Follow any comments here with the RSS feed for this post. Both comments and trackbacks are currently closed.